Wendell Clark routinely donates after leaving work at Neaton Auto Products Manufacturing in Eaton. That schedule will soon change because he plans to retire Feb. 1, 2019 after more than 31 years with Neaton. DAYTON, Ohio – As Thanksgiving Day nears, it’s hard to imagine how many patients owe thanks to Eaton donor Clark Clark. Community Blood Center’s all-time top blood donor just celebrated another milestone on his remarkable journey as a “Donor for Life.” Clark’s platelet donation on Nov. 18 marked his 680th lifetime donation, the equivalent of 85 gallons of giving. Clark last made headlines on Dec. 12, 2016 when he was inducted into the Fresenius Kabi National Donation Hall of Fame while making his 628th lifetime donation. Clark had been CBC’s top active donor since 2010. He became CBC’s “Top Donor of All Time” with his 602nd lifetime donation in 2013. Clark’s next goal is to become the first CBC donor to reach 700 lifetime donations. But he allowed himself a moment to reflect on his 680 milestone. 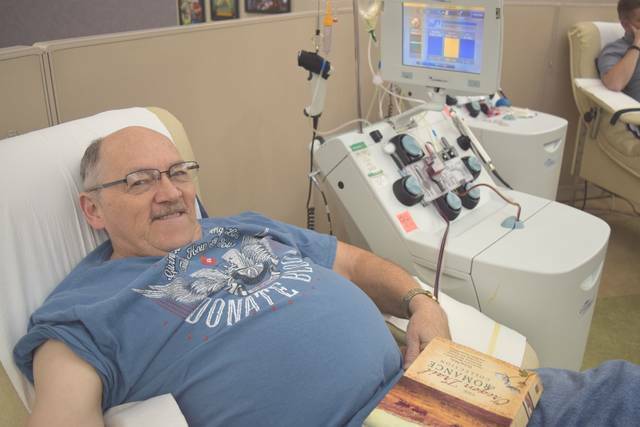 He said the turning point came when Collection Services Director Kay Ollech recruited him to become a platelet and plasma donor. Clark’s AB positive blood type made him an ideal plasma and platelet donor. “I said, do you prefer I only do platelets and plasma? They said if I would, they would love it.” He was soon making the maximum 24 platelet donations per year, plus plasma donations. An amazing footnote to his donor record is that he was diagnosed with prostate cancer in 2014. He underwent successful surgery and was deferred from donating for two years. Nearly two years to the minute from that surgery he was back in a CBC donor bed making his 609th lifetime donation. “Since my prostate surgery I’ve been coming every two weeks,” he said. Clark routinely donates after leaving work at Neaton Auto Products Manufacturing in Eaton. That schedule will soon change because he plans to retire Feb. 1, 2019 after more than 31 years with Neaton. He will focused more than ever on reaching 700 donations sometime in 2019.
https://www.registerherald.com/wp-content/uploads/sites/41/2018/11/web1_Wendell-Clark-680-LTD-1-_ne20181124204411919.jpgWendell Clark routinely donates after leaving work at Neaton Auto Products Manufacturing in Eaton. That schedule will soon change because he plans to retire Feb. 1, 2019 after more than 31 years with Neaton.